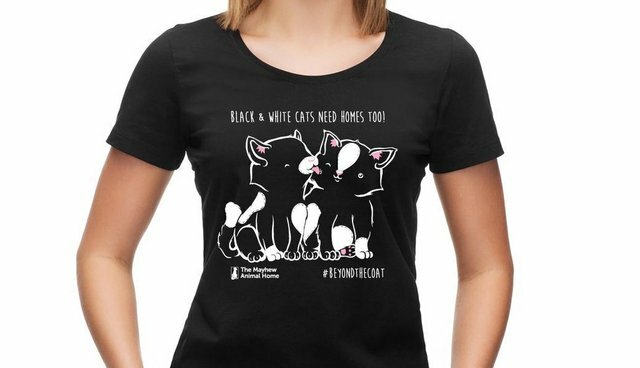 Black & White Cats Need Homes Too! Do you know that around 70% of cats in shelters are black or black and white? I was shocked too, given how many awesome colour-challenged felines there are out there. Mr Mistofelees from Cats the Musical? Felix the wonderful cartoon cat? Or Felix from the cat food can? And who can forget Postman Pat's sidekick Jess? It could be the case that when visitors are going around catteries to try and decide who comes home with them, the piebald pussies just don't stand out enough from the crowd. An optical illusion with a high cost! In an age where more 'novelty' breeds may be more fashionable and appealing to prospective owners, the classic American shorthair (a common breed for blade and white coats) may be seen as to ordinary. Whatever the reason, it's such a shame that these gorgeous, regal kitties can be passed by for a tabby or cappuccino-colored cousin. Anyway, to raise awareness about this issue, I've made a design that is getting printed on t-shirts, tanks and sweatshirts with 50% of the profit going straight to the Mayhew Animal Home and all the good work they do to find all cats (and dogs!) their forever homes.